Diabase, also known as bluestone, mainly consists of pyroxene and basic feldspar. Diabase can be used as the construction material because of its advantages of homogeneous structure and no cracks. If you want to process diabase conforming to the official specification of the building, it is necessary to choose solid equipment preferentially. HPT Hydraulic Cone Crusher with unique structure dose well in the crushing field, which has been widely used in highway, railway, hydropower station, etc. 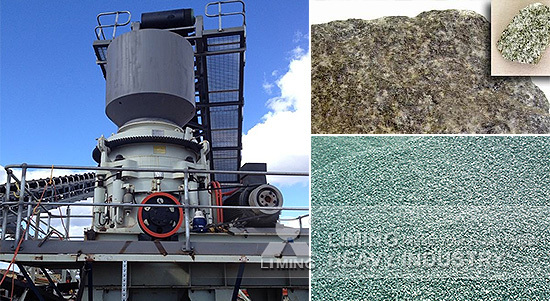 There are coarse crushing, medium crushing and fine crushing according to the requirements of input size and output size, and the demand of uniformity for medium crushing and fine crushing is higher than coarse crushing’ s. Aiming at medium crushing and fine crushing, HPT Hydraulic Cone Crusher made by Liming Heavy Industry takes great effects on the whole stone crushing line because of advanced technology and unique design. Adopting advanced theory, HPT Hydraulic Cone Crusher with reasonable structure takes advantages of high crushing ratio, high efficiency, large capacity and low costs. Besides, manifold crushing cavities are provided for you to satisfy the requirements of products’ size, and there is a hydraulic system providing overload protection, which makes running stable and safe. Besides diabase, HPT Hydraulic Cone Crusher can process many kinds of materials such as iron ore, copper ore, limestone, quartz, etc. It is ideal equipment for large stone crushing factory and mining industry.